Our Occupational Therapists specialise in neurorehabilitation and offer specialist assessment and treatment to our clients. Occupational Therapy takes a whole-person approach to both physical and mental health and wellbeing, enabling individuals to achieve their full potential. We offer practical support to enable people to facilitate recovery and overcome any barriers that prevent them from doing the activities that matter to them which may include personal care, activities involved in daily living, leisure and vocation. Occupational therapy aims to increase people’s functional independence and satisfaction in all aspects of life. We encourage clients to actively participate in setting their goals so that they are fully engaged in their rehabilitation programme. Our Occupational Therapy team therefore take a person – centred approach to rehabilitation and work closely with families and carers to provide education and training as indicated. We have access to specialist equipment including the bioness (functional electrical stimulation) device used in upper limb rehabilitation. We offer assessment and provision of custom made splints for the hand for positioning and functional use. In addition we run upper limb groups and individual treatment sessions to practise and relearn motor and sensory skills following brain injury. In conjunction with the multi-disciplinary team we offer specialist posture and seating assessment and advice. We have access to a wide range of specialist seating and wheelchair options. Clients have the option to trial what best meets their needs. 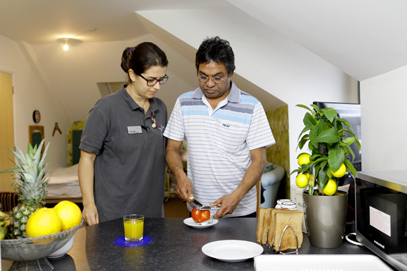 At Ascot Rehabilitation Centre we have independent living suites which are fully equipped to practise independent living skills prior to being discharged home. In addition to this we have a therapy kitchen to practise meal preparation tasks. As part of the rehabilitation programme we are able to offer community visits to practice skills learnt in therapy sessions. We are able to offer home visits and advise on equipment and adaptations prior to discharge. Occupational Therapists use evidence – based information in their practice to enable individuals to reable, rehabilitate and live as independently as they choose.